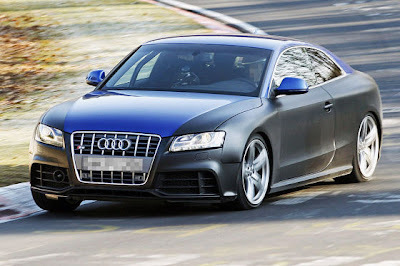 This is not the first time that the elusive 2010 Audi RS5 has been spied at the Nurburgring. As the car's official debut looms closer, we're sure there are just a few tweaks to be made to the latest Audi RS beast. Details are still scarce regarding what will power the RS5. Speculation points to a variant of the RS6's twin-turbo, 5.2-liter V10 powerplant. As the RS6 produces a mind-numbing 580 horsepower, many would guess the RS5 to come in somewhere just about the 500 hp mark. But, you never know, we may be pleasantly surprised with more.